The documentary Dogs on the Inside explores the relationships between abused rescue dogs and prison inmates working towards a second chance. One of those inmates shares his story. My name is Candido Santiago. 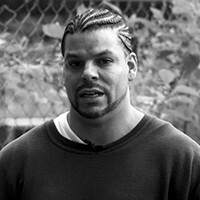 I served a 10-year prison sentence at North Central Correctional Institution in Massachusetts for selling cocaine and was released last year. In the final year of my sentence, I was one of the first inmates to sign up for a dog-training program run by Correctional Officer Reagan, which was supported by an organization called Don’t Throw Us Away. The program partners inmates with dogs rescued from Southern kill shelters where they in turn care for and help rehabilitate the dogs over the course of eight weeks, caring for its every need. I rehabilitated, trained, loved, and cared for six stray dogs over the course of that year. These dogs had experienced tough pasts, like myself and the other inmates. The dogs had been abandoned, neglected, or abused—sometimes all three. From the start, I made it a point to show each dog compassion and to earn their trust. I decided to participate because I am a dog lover and wanted the opportunity to have a companion while I was in prison, as well as learn how to train a dog. My experience working with dogs in prison had a huge impact on my life. At times during my sentence, I was really lonely and no one visited me. It was very tough. I once sent myself a card in the mail with my address on it just so I would have a letter to look forward to receiving. These dogs always lent me a non-judgmental ear when I talked to them, which is hard to find in an environment like prison. They were the ultimate companions. Each dog I was responsible for provided me love, trust, confidence, and a purpose. There was one dog in particular, a chihuahua named Sam, which really needed a lot of attention, love, and patience from me. When he first arrived, Sam wouldn’t come out of his crate at all. Let me tell you, it’s not easy building a bond with a dog when they are nervous, shaking, and won’t come out of their crate. So every day I crawled halfway into his crate to let him know I was there for him and I wasn’t going to hurt him. Eventually, Sam started to trust me and I didn’t have to crawl into his crate anymore! During my time with these dogs, I developed a bond with all of them and I cried when each of them left to go to their new home. It was bittersweet but I knew they were going to a much better place than prison, that’s for sure! I was able to gain momentum in bettering my sense of self-worth from all of the positive feelings the dogs gave me, which carried over as I was preparing to leave prison and re-enter society. The dogs helped us inmates become closer as well, as evidenced by members from rival gangs being able to find a common ground in the program. There were two gang members representing different colors who wouldn’t speak to each other. At one point, they were even on the verge of fighting. When the program came, it took a little bit of time, but bonding over the dogs eventually led to a friendship between both men. Currently, I am employed at a bakery that makes éclairs, where I work 12-hour shifts on the assembly line. The job is helping me get back on my feet and, while it’s certainly challenging, I am staying positive. I am going back to school because I believe in the power of education. Eventually, I want to become a zookeeper so I will be able to work with all kinds of animals. Nothing makes me happier than helping animals, and I’m grateful for being reminded of that while in prison. I don’t have a dog now because my landlord won’t allow them, but I take care of my brother’s dog and am going to begin volunteering at my local dog shelter. I know I made a difference in the lives of those dogs, and they certainly made a huge impact on mine. I don’t miss prison at all but, wow, do I miss those dogs! The documentary Dogs on the Inside is available now on iTunes, Google Play, Amazon Instant Video, VUDU, and dogsontheinside.com.